When Caer and Alison first came to live with us in February of 2008 Alison immediately took over the house. She loved all of the attention from the kids and from us and was fearless!! She seemed to be grateful to have a home. She and Caer did not intermingle at all because Caer spent the first 6 months here hiding from everyone. Alison enjoys sleeping on the top of the couch and in our bed with us. Caer first started coming out at night after the kids had gone to bed but was still pretty skittish. She started becoming a ‘real’ cat one year after coming to live with us. 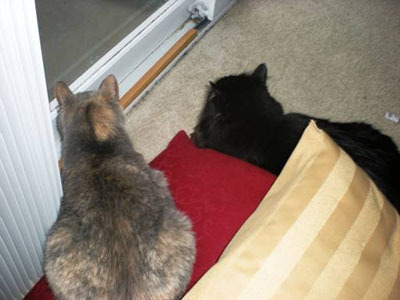 We were shocked when she and Alison started laying together in the window. She now comes out with the expectation of being pet and loved on and then curls up on her very own velvet purple pillow with her ‘baby’, a stuffed Felix the cat. Since obtaining two new kittens both Alison and Caer have found their ‘inner child’ and have adapted quite well to their new friends. They are teaming up and teaching the kittens to behave, but gently thankfully.